I was invited back to my local school to talk to Key Stage 1 about drawing as part of their art week. Once again I was so impressed at how enthusiastic and attentive the children were. I even stayed a bit longer this time and was able to watch the class have a go at drawing their own ‘doodle monsters’. Last year we focussed on patterns in nature, this year we looked at doodling crazy monsters from our imaginations. Watching the children afterwards it became crystal clear that they had a far better imagination that me; it was so rewarding watching them and glimpsing a brief insight into their world. I promised to create a half term challenge and at 14:30 today (cutting it fine) I delivered on that. 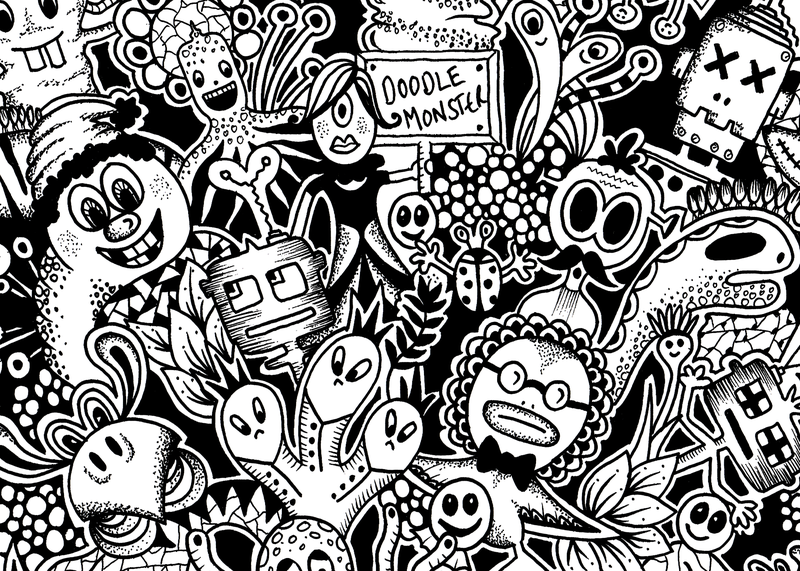 Children have been asked to fill a post-it note sized piece of paper with their doodle monsters and the winners will receive a pack of Uni-pin pens exactly the same as I use for my illustrations. I’ve even got a separate category for adults so I’m hoping a few parents and carers might enter too. The challenge ends on the 26th Feb and I’ll be posting some of the entries online, so watch this space.